This alternative interpretation demonstrates that the current 30-years warming is just a warming phase of a 60-years cooling and warming cycle. As a result, we should not panic with “widespread melting of snow and ice, and rising global average sea level” because that is what happens during the warming phase of the globe, and the snow and ice will form again during the cooling phase of the globe in the next two decades. Girma put up a chart to show what he meant by his 60 year cycle. It's not exactly 60 years. The first cycle was 65 years and the second was 53. His chart goes to 2010 (he wrote the article in 2011). I've overlayed his chart with the actual surface temperature from 1880 to 2015, using HadCRUT4. He would have been using HadCRUT3. Figure 1 | Girma's model from WUWT, with my annotations. Anyway, you get the idea. He saw a pattern of ups and downs in the long term warming trend. He saw that there was an upper limit and a lower limit to the trend. Girma figured the surface temperature would continue in this pattern. He thought once it hit the upper trend line the temperature would drop toward the lower. It hasn't. Or not so far. Instead it's broken out of his boundary lines. There's more. On the strength of this, Girma made a prediction looking ahead to 2030. Below is Girma's prediction as illustrated in his chart. 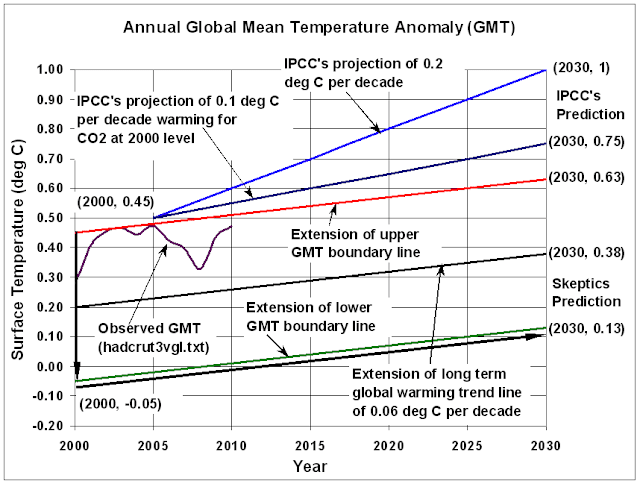 Figure 2 | Girma's model from WUWT, extrapolated with his prediction. Figure 2 shows that the upper and lower GMT boundary lines are parallel to the long-term global warming trend line for the whole data from 1880 to 2010, which has a global warming rate of 0.06 deg C per decade. The most important observation in this article is that the upper GMT [global mean temperature] boundary line passes through all the GMT peaks, the lower GMT boundary line passes through all the GMT valleys, and these lines are parallel. It was also found that the line that bisects the vertical space between the two GMT boundary lines is nearly identical to the long-term global warming trend line of 0.06 deg C per decade for the whole data. This result indicates that, for the last 130 years, the GMT behaved like a stable pendulum with the two GMT boundary lines that are 0.5 deg C apart as the end points of the pendulum’s swings, and the long-term global warming trend line of 0.06 deg C per decade as the pendulum’s neutral position. As a pendulum with a constant swing does not have a “tipping point”, the claim of a climate tipping point is a science fiction, made by those who unfortunately make their living by scare mongering. I've done something similar to his second chart. I've overlayed the actual temperature from HadCRUT4. Figure 3 | Girma's model from WUWT, extrapolated with his prediction, with my annotations and additions. As you can see, the temperature hasn't just misbehaved and not swung back down as a pendulum should, it's shot up above Girma's impression of the IPCC's upper level prediction. Here is a question to climate scientists: In Figure 2, why has the GMT touched its upper boundary line only 3-times, every 60-years, but has never crossed it for long in the last 130 years? That's not hard to answer. If he'd positioned his upper line lower, the temperature would have broken through twice in his chart. Look at the chart below and you'll see what I mean. If instead of choosing the orange dotted lines as his boundaries, he'd instead chosen the purple dotted lines, the temperature anomaly would have busted through. As it is, it's broken through his upper boundary now. Figure 4 | HadCrut data with lines like Girma's, and shifted. Anthropogenic global warming advocates always accuse skeptics of cherry picking. A working definition of a cherry picker is one who makes conclusions based on comparison of oranges to apples. Let us see who is the greatest cherry picker. That's not it. Cherry picking is picking out the bits that you think support your argument and ignoring the bits that don't. I'd say that Girma became horticulturally lost. In Figure 2, although the upper GMT boundary curve is a straight line for the relatively short 130 years data, in a longer time scale, it is part of a very long curve that contains the Little Ice Age, Medieval Climatic Optimum, Holocene Maximum, etc. He wrote that two years before Marcott13 and PAGES 2k. Your guess is as good as mine about where he got his surface temperature reconstruction for the entire Holocene, especially one that claimed a good resolution on annual timescales. Figure 5 | HadCrut data going back to 1850, with lines like Girma's. If he'd added in the previous years, his upper and lower boundary lines wouldn't fit. However in the comments he linked to a chart that he seems to think works, though he had to change his boundary lines for it to do so. Not only does his new chart pop out of the boundaries more often, it mucks up his claimed 60 year cycles. A valid example of identifying whether the GMT data shows accelerated warming is to compare the change in GMT during the recent warming period from 1970 to 2000 with the previous warming period from 1910 to 1940, which are of the same duration. 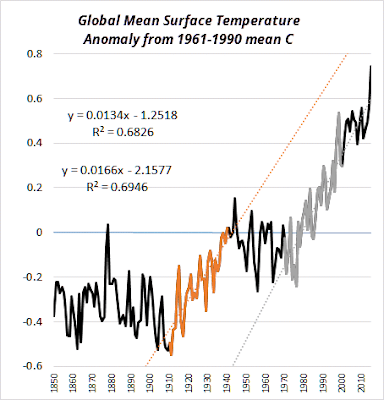 As shown in Figure 2, for both periods the change in GMT is about 0.68 deg C. As a result, there is no acceleration in the recent warming period compared to the previous one. It looks as if he just eyeballed the difference in surface temperature rather than actually working out the trend. Using HadCRUT4 the trend for the latter period is higher at 0.166 C/decade, while the trend for the former is 0.134 C/decade. 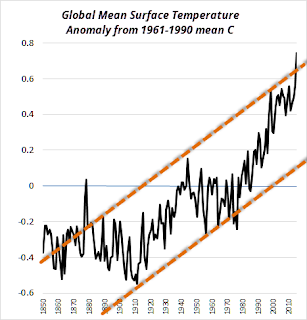 (The trend from 1970 to 2015 higher still at 0.169 C/decade). Figure 6 | HadCrut data with linear trends for 1910-1940 and 1970-2000. In my case, I will replace the word “physicist” with “engineer”. I've written about Girma's nonsense on a previous occasion, but I haven't seen him around lately. I wonder is he revising his conspiracy theory in recursive fashion to take account of the recent hottest years? This blast from the past is an opportunity to see if WUWT fans have changed in the past four years. There were more of them commenting back in the old days. Other than that, not much has changed except the nutters used to get a bit more pushback from pro-science types. Thankyou Dr Orssengo. Another brick in the wall. Unprecedented in its simplicity, and irrefutable in its conclusion. Brilliant. If we have descendants, they will look on the late 20th century and early 21st as a bizarre and tragic time of utter lunacy, when almost every branch of science ferociously pursued blatantly obvious lies and instantly disprovable nonsensical theories, abandoning all previous clear understandings. Only biology and geology have been comparatively exempt from the mass hysteria. This 33/66 cycle was well known in the ’30s, as I’ve pointed out here at least 33 times. Maybe 66 times! What sort of analysis is this? It is truly weird to fit a model with no justification and expect it to be in any way related to reality. That brings me to my point, assuming the data are valid. We know that the data were adjusted and manipulated to show lower values in roughly pre-1970 and warmer values post-1970. In essence, the data were manipulated to impart a slight positive trend. That alone likely accounts for the increase of 0.06 degrees Centigrade per decade. Without that deliberate adjustment, the data would likely show zero warming at all. The un-adjusted data could very well show a cooling trend, which would coincide with the evidence now before us all. RoHa says: August 19, 2011 at 6:47 pm "So the temperature is going to start dropping to Little Ice Age levels again? Even with a Maunder type minimum, the earth of 2011 far different in atmospheric composition than the earth of the 1600’s. A new “little age age” is quite unlikely. Mike Jowsey sees slightly different cycles, and thinks that it will cool after 2013. Didn't happen. Looking at Figure 2 it seems that a 33/66 cycle would be a more accurate pendulum swing. It would not change the 0.06dC per decade trend. It would, however, have the second cycle in the dataset ending in 2012 rather than 2000. This would also indicate that the next cooling phase is 2013 through 2036. Interstellar Bill is going to hold R. Gates to his idea that a Little Ice Age isn't coming any time soon. So far R. Gates has the upper hand. (which are notoriously replete with every kind of bad outcome). as bolstering their case, but reluctant to accept anything as weighing against it. that a new Little Ice Age is quite unlikely. Finally, something that disproves AGW! We’ll hold you to it. I can think of another one, though: CO2 levelling off. Bill H sees a sine wave. Does that remind you of anyone? the positive slope in the 60 year cycle is the long term warming that has been occurring since the last ice age. what i am finding in my studies is rather simple. the earth and its systems are all in a phase of sign wave. if we extrapolate the graph out to several thousand to hundred thousand years you would find a sign wave or oscillation of the warmth/cooling trends. Alexander Feht flings wild accusations of fakery. Another climate hoax conspiracy theorist. And this is assuming that known fakers’ data hasn’t been faked by the fakers! Alarmists have painted themselves into the corner. Girma had the almost last word, saying something about nature exposing them. It's exposed Girma, hasn't it. They have completely ignored the cyclic nature of global mean temperature, and it is just a matter of time that nature will expose them. Desperate Deniers - a series of articles about the protests at the hottest year on record - again. Feynman would have skewered Girma immediately - just because you can come up with alternative explanations doesn't mean those are right or that the commonly accepted one is wrong. The question to ask in all of these curve fitting exercises is what is the physical reality? Deniers don't seem to have an answer. Orssengo was skewered repeatedly and continuously back in 2009 when he first appeared on Deltoid peddling his pseudoscience, but he blithely ignored the corrections put to him by many folk, including myself. I was going to make a comment that the analysis of Girma Orssengo PhD had been comprehensively refuted by Dizzy Pogue-Mahone (D.Phil. ), but it turns out there is actually such an individual. Apologies for my Anglo-Western prejudices; this will not happen again. An early rendition of the stadium wave fizzles out in the nosebleed section. Girma was a frequent commenter at Climate Etc., and I have always thought he inspired the stadium wave. Another failed prediction - the Open Atmospheric Society? ...But that was confidently predicted to be the terror of all warmists. And just a while ago (coincidentally just when subscriptions became due) Anthony was telling his fan boys about the hard work done on it so far. Looking at the sums they have so far collected ($1135, target $2000), they have between less than 2 and no more than 45 members, depending on the level they subscribed at. The most read climate site has readers not inclined to put their money where their mouths are, or perhaps they know when they are being taken for a ride (not likely I know). Feynman was polite enough not to openly call them cranks, but his amusement was clear enough. The funny thing is that the deniosphere has claimed Feynman (along with Galileo) as supporting their crankish and deeply anti-scientific attacks on climate science. When Girma commented frequently, I pondered how somebody like him could exist. As Magma notes he actually got himself a PhD but I had never seen anybody that brain-dead before. Is this guy real? He has one heavily cited paper from research he did for (presumably) his thesis advisor. But after that, nothing. Did the guy perhaps die or did he go back to his home country, and somebody reused his name as some sort of Poe? Or did his advisor just use him as disposable grad student fodder to type up his own research? The latter could happen if a thesis defense committee is lax on their job and allow someone like Girma to get through. For awhile there, Girma would comment daily at Curry's blog. One of the gang of Aussies that would relentlessly comment there, with names such as Myrrh, Chief Hydologist, BethTheSerf, Peter Lang, Mike Flynn, Doug C@tt@n, StefanTheDenier, Alexander Biggs, Tim Curtin, David Archibald, BLouis, Greg House, Konrad, RiHo, John Reid, Angech, ROM, Ian Wilson, David Stockwell. I wrote these guys down as I came across them because they would invariably have some crazy theory for debunking CO2 as a GHG. All appearing very desperate. I always wondered why all these Australians would congregate at Curry's blog. I still think the horrible CSIRO decision may have something to do with Curry's impact. So WHT, did Girma's game changing work inspire the Stadium Wave? October 1998: DOCTOR OF PHILOSOPHY, University of New South Wales, Sydney, Australia. The thesis dealt with the application of finite element modelling in the analysis of contact lens manufacturing processes. March 1994: GRADUATE DIPLOMA IN COMPUTER SCIENCE, La Trobe University, Melbourne, Victoria, Australia. May 1992: MASTERS IN APPLIED SCIENCE (MECHANICAL ENGINEERING), University of British Columbia, Vancouver, British Columbia, Canada, which focused in the Finite Element Analysis, Mechanics of Solids, and Partial Differential Equations, and the thesis title was Stress Analysis of Metal Cutting Tools. June 1985: BACHELOR OF TECHNOLOGY IN MECHANICAL ENGINEERING (HONOURS), University of Calicut, Kerala, India. "The next CEO of Australia’s leading research agency, the Commonwealth Scientific and Industrial Research Organisation (CSIRO), is in hot water after suggesting the cash-strapped organization spend scarce research dollars investigating water divining, or dowsing." As my late father would occasionally advise, "Don't be so open-minded that your brain falls out." The Stadium Wave was a thesis of one of Curry's PhD students. Not sure how much Curry contributed. The paper was Wyatt & Curry and Judith obviously promoted it quite a bit. Not sure Wyatt was one of Curry's PhD students...I think she was Tsonis' student. Curry came in later. The "Ozzie connection" is interesting. I do not know about Dr Curry's blog but someone suggested time zones might be a factor. I did trace a bunch of climate change deniers on one blog back to what appeared to be an anti carbon tax, anti Julian Gillard group that also appeared to cluster around Singleton NSW. Hard to tell really, the sockpuppet use was obvious. Twinotter, time zone is a factor. When Curry posts in the evening, all you get are Australian commenters through the night. It would be fun to adapt "The Crackpot Index" (http://math.ucr.edu/home/baez/crackpot.html) to climate science instead of physics. It was created years ago by John Baez and it is a entertaining read, mostly it applies directly to attempts as referred to in this post. (The Feynman reference triggered my memory). I work indirectly with John Carlos Baez by contributing to his Azimuth Project site. It's interesting that he wrote the Crackpot Index considering that the focus of Azimuth has been to tackle challenging math and physics problems via the participation of outsiders. So we are definitely outside of the mainstream but I have been reminded by John not to say that any of our findings are outside of the mainstream. The mainstream being the conventional peer-review + journal process. I can figure out why he wants to lay low because he's sensitive to being identified as a non-mainstream crackpot and perhaps hypocrite himself. IMO it's become a Catch-22 in trying to publicize any of the promising results that have been achieved at the Azimuth Project. I have no doubt that there are pitiful crackpots out there, Girma being an example, but I am most upset that they have essentially poisoned the atmosphere to other diligent and honest researchers that may not be affiliated with name institutions. I believe I see your point, and I can understand being sensitive. On the other hand, "crackpotiness" is not to be confused with "outside the mainstream". The former makes no sense, the latter does make sense but is an unusual or novel way addressing a problem (may still be wrong but is at least consistent and worth a look). The problem is confusing the two. Crackpots invariably believe they are in the "outside the mainstream" category (and persecuted). while scientists tend do dismiss "outside the mainstream" because of the conflation of the two categories. Oh c'mon! At least *some* points should be awarded if they can actually spell the names correctly? Hmm, perhaps. But not for spelling their own name correctly? Eli is slightly dyslexic, but Grima?? I expect you'll use that chart forever, Girma, since HadCRUT3 only goes up to May 2014. That is, it stopped before the three-in-a-row hottest years on record. That's not denial, that's just plain old lying by attempted deception.